One of our more prolific setters greeted us this week and no doubt it would be quite tricky. His last was the puzzle that combined John Donne’s Holy Sonnets and single-letter chemical elements. This week, as with other Listener’s recently, an oddly shaped grid. 1ac and 5ac were quickly solved: AFEAR and GIMME. I liked Ifor’s definition of the latter: giveaway, not needing a hit. It is more realistically defined as an agreement between two golfers, neither of whom can putt very well! After those first two, my success with the acrosses was somewhat sporadic, made a tad difficult because each had an extra word that had to be removed before solving. As for the downs — well. 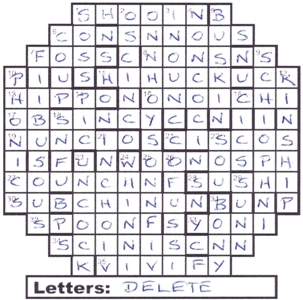 Lots of 3-letter answers, plus a lot more 6-letter answers that could be split into 3-letter words. Each had a number in brackets that dictated which clue(s) each 3-letter word thematically contributed. Moreover, the letters either side of each extra word would spell out two messages: an instruction that had to be applied to the unclued 8dn, plus a clarification of what that entailed. It became fairly clear to me that all these little words would somehow anagram to the entries they contributed to. However, I confess it took the messages from the across clues to fully spell it out. I saw Cyril lurking there, followed closely by Russ, but it took Dolly’s discovery for everything to fall into place. The down entries would be like those Russian dolls that fitted inside each other with one word inside another inside a third and, in two cases, inside a fourth. Finally the two messages were Enter Russian doll and Cyrillic capitals. My Russian is a bit rusty, so I needed Google to reveal how MATRESHKA needed to be modified for the Russian equivalent. I think it was MAPЁшKA, although I’m not 100% certain if the dotdot over the E is mandatory or not. I must also confess that I’m flummoxed by the clue to 21ac Whoop [unlikely] approval and take time after flight to Medina; it obviously referred to HIJRAH but I couldn’t see what knocked the HIJ off. All in all, good fun as usual, so thanks to Ifor. Great title, too. Apparently, the world record is 51 dolls! Yet another rather unusual grid, We read through the preamble with no undue concern and noted the ‘Iforish’ device of extra words in across clues producing letters that would lead to two messages, one telling us what to enter at 8dn and the other telling us what entering that would entail. I scanned the grid for a sprinkling of alcohol and didn’t find much – in fact only a BAR in ‘Support for women without needing right to be promoted’. We had to promote the R in that clue leading to BRA so it was a rather reluctant ‘Cheers, Ifor’ until the clue ten further down ‘Lots of fluid from burst blisters after removing skin’ led to an anagram of (b)lister(s) and LITRES. Hearty cheers, Ifor! Solving as many across clues as possible was clearly the way to go and the three-letter ones went in fairly quickly, followed by WARLORD, GIMME, AFEAR and TABARDS. HEADSHEETS had to be the answer to ‘Bows change these in pursuit of titles’, (HEADS+ SHEETS*) and we were helpfully told that this had to be 10 letters long and tentatively placed the SH in the centre of the answer. We were producing a message (well, the beginnings of two messages) ENTER RUSSIAN ???? and CYRILLIC CAPI ??? ?, and what was even more helpful, TEA and Chambers gave us suggestions for those long down clues, WITHEREDNESS, AGALACTIA, FIREBRAND, AMOURETTE, REREDORSE and DISFEATURING. MOHAIR and we could see that AHS must be the entry to the first of the downs, nested in MIR – penny drop moment!NESTED! Suddenly it all made sense. We had LAC, nested in GAT, nested in AIA. DISFEATURING was made up of EAT, in FUR, in SIN nested in DIG. Nesting dolls! Surely we each received a set of nesting dolls as a present when we were small. Of course the unusual shape of the grid now made sense – there was our Babushka! So SPA went into INN, CAN into ARE, HEM into TIS, ASH into PED, and BAN into LIT and our grid was complete, except that we had to. ENTER RUSSIAN DOLL in CYRILLIC CAPITALS. We had a putative MATRYOSHKA down the centre of our grid and knew we had to be careful after that KOHb of some years ago so carefully checked our capitals with the Russian neighbour and opted for MATPEWKA – or a version of that. Very ingenious. Thank you Ifor. Last year’s Ifor puzzle noted the achievement of Edward Eagan and the coincidence of his two Olympic wins for boXing and boBBing. Without jumping ahead too much, this puzzle delighted us with an even more fascinating coincidence. I’ve always thought of Ifor as the deletions king. For example (from another puzzle): Revamped department after sacking rogue and seductress (7) leading to DEPARTMENT* – AND* for TEMPTER. So this week, he was in seventh heaven with clues and entries having deletions galore. 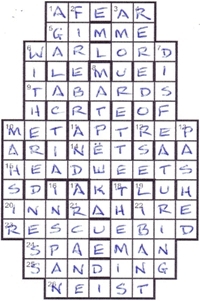 I was somewhat worried that 20 clues would lead to non-word grid entries, but hopefully things would be definitive. It took me some time to get my head around the different clue types: all of them had an extra letter; 20 clues were normal, nine had definitions for the entry but wordplay for a longer word, and nine had definitions for a longer word but wordplay for the entry. I decided to highlight entries in the grid according to their clue type: yellow for normal, green for entry given by definition, and orange for longer word given by definition. I won’t show you my worksheet since I got the colouring wrong a couple of times and it looks a mess! I failed with 1ac Contents of noisy show shot during filming (8) and 6 Tricks on University senate going wrong, taking in Academician by agreement (13) looked like CONSENSUAL or some variation; it turned out to be CONSENTANEOUS — CONS + (ON U SEN[a]TE)* containing A. 13ac Poe paid him to shift large river creature (9) looked like an anagram of Poe paid him but with an extra letter. It didn’t take too long to see HIPPO, but I needed C to reveal HIPPODAME, which was new to me. Mind you that had to go into a 6-letter space. After a pass through all the clues, I had solved precious few. Even the straightforward normal clue at 24dn Sounded like a horse we hid[e] craftily outside pub (8) WHINNIED couldn’t be entered as the letters needing to be dropped for a 6-letter entry could be any of them. It did, however, enable me to mark its symmetrically opposite entry 3dn as a normal clue. Progress was very slow, almost as slow as Sabre’s from the previous week. All the clues were up to Ifor’s high standard but, even so, some were tricky to unravel. For example, 15ac New zoo that unveiled trick flying after acquiring one group of sparrows (11) led to ZONOTRACHIA — (N ZOO [t]HAT (t)RIC(k))* holding A. There were also some far-from-everyday words, such as SCINTISCANNER and HIGH-MUCK-A-MUCK. The message finally spelt out by the extra words in clues was nothing to do with Winnie the Pooh (“I am a bear of very little brain”) but I am a little world made cunningly of elements. Even then, it took a couple of seconds for it to sink in: the letters that were in the grid were all the single-letter chemical symbols. Thus there was no A, D, E, G, J, L, M, Q, R, T, X or Z. The quotation was from John Donne: “I am a little world made cunningly / Of elements and an angelic sprite”. The final tidying up was spotting that Nadal becoming nada was the “change in capitalisation” in the preamble, and working out what some of the longer words were before being reduced. 14dn PIC was reduced from its longer word DEPICTED (described minutely), and 23dn Let down hammer of Colt — in rearming must prepare to shoot with bow (8) wasn’t UNCOCKED but TURNCOCK: rearming became rearing and we had C (Colt) in RUT< (must) + NOCK (prepare to shoot bow) — now that's the devilish clue of the day! The last step was to work out the deletions that needed to go beneath the grid. This wasn’t all the letters in the list above, but just those from [D]ONN[E] HO[L]Y SONN[ET] FIV[E], and they spelt out the best BGM (Big Grin Moment) for many moons: DELETE! Once again, I was amazed at the foresight of authors and other famous people of yesteryear who have been used in Listener themes. John Donne could have written Holy Pentameters or included these lines in Holy Sonnet Four, but no, neither would have enabled DELETE to be spelt out. Thanks for a really tough challenge, Ifor. Phew! Oh dear, a carte blanche, and there are going to be two extra letters produced by the wordplay of every clue, that we are somehow going to sort into two instructions that will each occur twice but in a different order. This looks complicated and fairly difficult (which is what we have come to expect from Ifor). Of course, I don’t need to check that Ifor retains his place at the Listener setters’ bar but I check anyway and find ‘Ordered tonic water after dropping in briefly to bar’; I remove I’ and TO from ‘tonic water’ and find RANCE which means ‘bar’ with extra letters TW. Tonic water? I hope Ifor ordered something with that tonic! Ah, there’s port too; ‘Port sent part way round, not yet emptied out’. (Must be one of those alcohol sales gimmicks where they say your port or cognac has been to the equator and back!) I am disappointed when I remove YT from SENT PART WAY and find my port is simply ANTWERP with AS extra. No problem; Ifor is soon into the red, ‘Condition red: time to get out something like a lane marker’. This is promising until I realise that ‘red’ is an anagram indicator and that CONDITION minus T gives us CONOID with IN extra. Oh dear again – just a road cone. But all is not lost. I find ‘rum’ – Rum old hospital: “Doesn’t hurt keeping dead bits left over” Well, that sounds lugubrious but “Cheers!” anyway, Ifor. We have already put UNSCRATCHED on row 1 and that last clue, after giving us ODD SAN D(ead) ENDS and an extra TO, fills the final row. We are still grand-child minding in California and the day is taken up with a visit to the magnificent Monterey aquarium, so solutions are slotted in between visits to otters, penguins and the astonishing hopping blennies but by late evening we have a full grid and two locations, ANTWERP and LAKE PLACID. We have to sort all our extra letters into two instructions and we laboriously find READ ONE ROW IN REVERSE – well, we have already seen that so we didn’t need that instruction, but we also find INSERT TWO ENTRY NUMBERS. Numpty head scratch; this was a carte blanche. How are we going to resolve that ambiguity by entering two numbers. I take the problem to bed with me together with that rum, port, red, tonic – whatever, and, of course, as I mentally insert clue numbers into the grid, all becomes clear. The 1920 and 1932 games. Auntie Google tells me that Eddie Eagan was almost refused entry to the 1932 games because he was thought to be too old. He proved them wrong didn’t he! So cheers, Ifor and many thanks for a real challenge. Poat’s hare seemed to come to a sad end, transfixed by William the Conqueror’s arrow a week ago, much to the distress of a few fellow solvers who felt that like that TABU and KOHb, he had become somewhat of a Listener fixture. It seems that all is well, however, and that the arrow damage was skin-deep, as Ifor had a boxing and a bobbing hare tangled pugnaciously at the top of his grid. Imagine my surprise when I scanned Ifor’s clues and found not a single alcohol reference. Do we have to withdraw his access ticket to the Listener Setters’ tippling club. Of course not! What did we find when we had completed our solve? CHAMPERS and probably vast quantities of it as in the NEBUCHADNEZZAR of Atlas’s crossword a couple of weeks ago. Cheers, Ifor. The title and preamble should have given me far more help that they did. RAT = DESERT I = ISLAND and OS are discs. Typical of Ifor’s very clever setting. And what was the ‘Harmony’ that used to introduce DESERT ISLAND DISCS? It was ERIC COATES ‘BY THE SLEEPY LAGOON – but we were a long way from teasing those letters out of the extra pairs in 27 clues. Of course I gave myself a hearty kick when I realized that we are celebrating a 75th anniversary of the very first broadcast of the programme since Roy Plomley presented it before I was even born on 29th January, 1942. Of course, just counting clue lengths told us which solutions were going to have a ‘thematic item’ removed from them. We are not very knowledgeable about varieties of modern music so some of those extracted words were quite a surprise. We found LAY, RAP, RAG, CATCH, ARIA, PORT, MENTO and OAT. I wonder which celebrity opted for that lot (David Beckham, maybe?) We were mildly puzzled by SCABBARD (B BAR in SCAD) but then remembered that the castaway is allowed to take his Shakespeare with him, so we entered SCAB. 2ac had us puzzled too. The clue seemed to give us TOTIENTS but four letters had to come out. Then we remembered that the castaway has his Bible so this was the clue where the thematic item was in two parts OT and NT leaving TIES. The grid was nearing completion when we saw that fine clue ‘One who supports boxer, maybe (6)’ that gave us B/PACKER and produced not only the CHAMPERS but also what every solver needs: CHAMBERS. 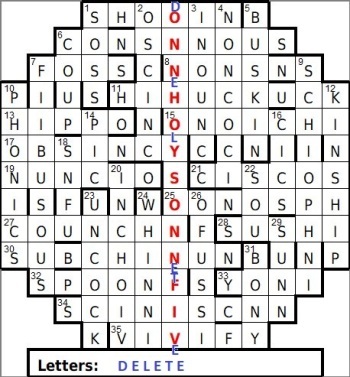 We hadn’t found it easy to solve this crossword, but that solution really produced a smile. A moment of hesitation. ROY PLOMLEY was the originator of DESERT ISLAND DISCS and his name (forename and surname) add up to 10 letters but, after a moment of hesitation, we opted for the creator of The Harmony, ERIC COATES. Nice one, Ifor. Many thanks. And the elusive HARE? He’s kind of stewed up this week in clues 14, 17 and 18: I imagine his days will be numbered if he turns up on a desert island. He’ll be castaway stew.